Dioner Navarro drives in the Reds’ first two runs of the night. 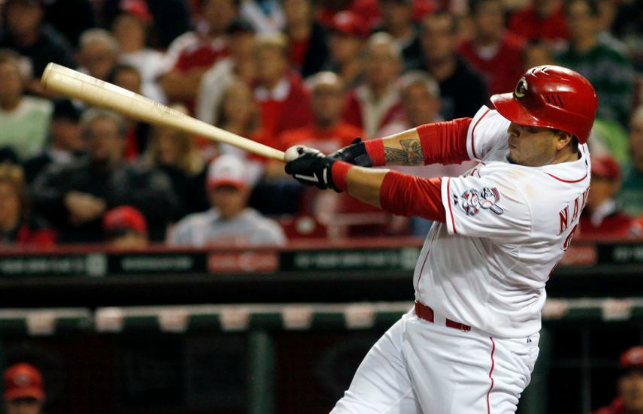 The Cincinnati Reds won the opener of their final home series of the 2012 season, defeating the Milwaukee Brewers 4-2. Johnny Cueto started and pitched better than he has in a while. Cueto lasted 7 innings, allowing 2 runs on 5 hits and no walks while striking out 5. He weathered some concern over a potential leg issue early on in the game, but clearly it didn’t bother his pitching. In his first attempt to pick up his 19th win, he did so. He should have 1 more chance to get to number 20. The Reds took the lead in the bottom of the 2nd and never let it go. After three singles from Jay Bruce, Chris Heisey, and Drew Stubbs, Dioner Navarro came to the plate and drove in two with a line drive to left field. In the 5th, after the Brewers had gotten on the board, the Reds responded by getting that run plus another back. Zack Cozart led off the inning with a triple. Joey Votto followed up with a double to score him. Two batter later, Bruce doubled in Votto. Those 4 runs were enough for Cueto and the bullpen to handle. Jonathan Broxton pitched his scoreless 8th, and Aroldis Chapman, in his first save appearance since his long break, had an easy 1-2-3 9th. Chapman failed to strike anyone out, but his fastball was in the high-90s. His control was improving as the inning went along, too. The Reds and Brewers play the second game of their series tonight. Bronson Arroyo will continue the Reds’ fight for the best record in the National League, while Shaun Marcum will try to keep the Brewers’ wild card hopes alive. Game time is 7:10pm. Posted in Cincinnati Reds, Game Wrap, Milwaukee Brewers, NL Central. Finally, after what seemed like an eternity, the Cincinnati Reds had a good start. 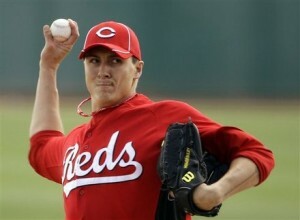 And this one from Homer Bailey was great. For the third time in his last 4 outings, Bailey went 8 innings. He dominated the Milwaukee Brewers of that time, allowing just 6 hits, walking none, and striking out a career-high 10. In short, it was an amazing performance. And it’s one that’s becoming more and more customary from Bailey. So far in 2012, Bailey is turning in the best year of his career. He has his lowest ERA at 3.74 (and highest ERA+ of his career at 112). He’s got his lowest WHIP at 1.271, and is approaching career highs in games started, innings pitched, and strikeouts. Wins aren’t the best measure of a starter, but with the win last night, Bailey did tie his career-high of 9 wins. Oh, and did I mention he’s just 26 years old? Despite how long it feels like Bailey’s been with the Reds, he’s still young. And more and more, it’s looking like the year he really puts things together. He’s come a long way from looking like Keanu Reeves’ grandmother. Of course, Bailey couldn’t win the game by himself. The offense had to score some runs. All 3 of the Reds’ run came from solo shots. Zack Cozart hit his 10th, Jay Bruce hit his 19th, and Scott Rolen hit his 4th. Bruce broke a bad 0-19 slump with a 2-3 game. With Joey Votto out, this would be an awesome time for Bruce to go on one of his patented Player-of-the Week tears. And Rolen was playing with more energy than I’ve seen all year. He went 2-3, as well. The fastball he hit for his homer was hit with more authority than I’ve seen him swing with since 2010. If Bruce, Rolen, and Brandon Phillips–the hero of the previous game–can keep stepping up, this stretch without Votto could turn into a big positive for the team. The win keeps the Reds in first place, 1/2 game ahead of the Pittsburgh Pirates. The Reds look to increase that lead when they play their second game against the Brewers tonight. Bronson Arroyo will start against Yavani Gallardo. The first pitch is scheduled for 7:10pm EDT. 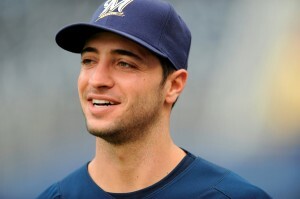 Milwaukee Brewers outfielder Ryan Braun has won his appeal to overturn a positive drug test. Braun became the first major-league player to have a positive drug test overturned when he was informed Thursday that an arbitration panel ruled in his favor on appeal and decided against a 50-game suspension for the reigning National League most valuable player. This is obviously huge news for the Brewers, who were potentially facing starting a season without both Prince Fielder and Ryan Braun. Now, the reigning MVP will be available from day one, meaning their offense will be far less punchless. Details on why Braun is now also an MVP of drug test appeals were not released. The independent three-person arbitration panel’s decision was a 2-1 call. And MLB isn’t happy about the decision. I’m sure we’ll be hearing plenty about this for the next few days, especially tomorrow from Braun himself when he reports to Brewers’ camp. Earlier this week, MLB announced the winner of the National League’s Most Valuable Player award. We all knew that Joey Votto would not be repeating for the Cincinnati Reds, thanks to their craptastic year. But we all wondered where he would place and how many votes he’d get. As expected, the Milwaukee Brewers’ Ryan Braun won the award. And Votto placed sixth. Votto was on a majority of the ballots, and I might quibble with him finishing lower than Prince Fielder–who is grossly overrated, in my opinion–but it’s still nice to see him getting some love. He’s very, very good, and I’m going to enjoy his time as a Red as long as it lasts. In fact, I’m sure I’ll be wearing my Votto jersey this weekend at RedsFest. Posted in Cincinnati Reds, Human League, Joey Votto, Milwaukee Brewers, NL Central.